We are in the process of moving to a new fulfillment center and we will not have any telephone coverage beginning February 26, 2018. If you need any information, we will be replying to emails at this address: info@widewidths.com. We will not be re-stocking any other boots for Winter 2017 but please check back for a brand new collection of plus calf women�s boots once our shipments begin to arrive in the late summer for Fall 2018. We are an INTERNET-ONLY company and we do not have any retail outlets nor do we sell wholesale. We do not publish any catalogs. All of our products are shown on our site with up-to-date size availability for each item. By shopping online, you will be able to see brand new merchandise as soon as it arrives as well as up-to-date size availability since our site is continually updated. For our international customers, since our company is based in the United States, our prices are all listed in U.S. dollars and our sizes are all shown in U.S. sizes and inches. For currency exchanges, please check with your local bank or on Google since we do not supply this information on our website. 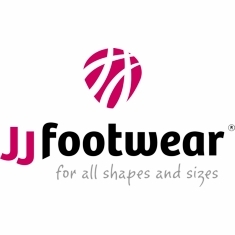 For information on international foot size conversions please see this link: International Size Chart For information to convert from centimeters to inches please see this link: Metric Conversions. Please make sure to measure your calf first before ordering! 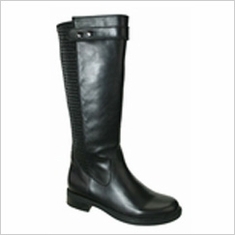 Our company has four different categories of custom made calf sizes: WIDE CALF BOOTS, EXTRA WIDE CALF BOOTS, SUPER WIDE CALF™ BOOTS and SUPER PLUS WIDE CALF™ BOOTS. These categories are shown in the name of each boot. Every boot already comes manufactured with its own specific calf size for each foot/shoe size so please make sure to measure your calf exactly before you order. 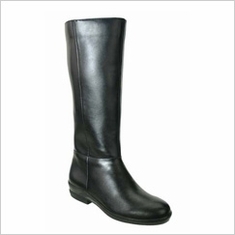 As a result, you cannot order a boot with a different calf size than the one shown for that particular style. Since we have a very extensive selection of boots with different calf sizes, you can be sure to find a style that will come as close to your calf measurements as possible. How do I know which calf size is the best one for me? 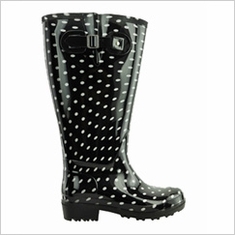 Please see how to choose the right boot before you place your order. 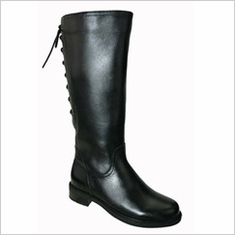 Most of our boots have a 14 - 15" high shaft and the shaft heights are listed in all of their descriptions. 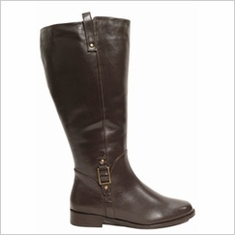 This refers to the height of the boot from the base of your bare foot NOT including any heels. As the foot size gets larger, the shaft height increases fractionally. Using a tape measure, please measure the circumference of your calf 14 - 15" up from the base of your foot (or at it's widest part if you are petite) to find your correct calf size. If there is a portion of your calf that is wider than that measurement, then please order using the larger of the 2 measurements. Please remember that MOST of the zippered non-stretch boots that have an elastic gore will stretch about one inch more than the calf size in their description. 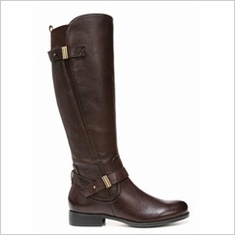 They will only stretch at the topline, not along the entire shaft of the boot. What do the letters M, W, WW, D or EE next to the shoe sizes mean? 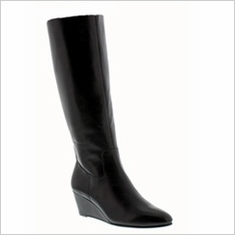 Our company carries wide and extra wide calf boots in many foot widths as well. These letters refer ONLY to the width of your feet, NOT the size of your calf. The letter �M� refers to a medium width foot, the letters �W� or �D� refer to a wide width foot and the letters �WW� or �EE� refer to an extra wide width foot. What is a boot �shaft�? A shaft is the body of the boot and it is the height that the boot goes up to on your calf starting from the bottom of your bare foot. It does not include the heel height. The majority of our boots have 14 - 15� shafts and all boots have their appropriate shaft heights shown in the descriptions. As the foot size gets larger, the shaft height increases fractionally. 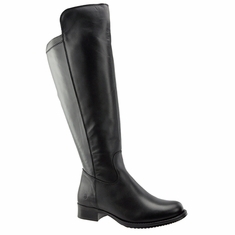 There are no wide calf or extra wide calf boots made with higher shafts than these other than our wide calf over-the-knee styles which have the highest shaft heights. These boots are a very good choice for those of you that are tall since they can be worn with the cuff folded down as well. What if my calf size is in between two different categories? If, after measuring your calf, you find that your size falls between two different categories (e.g., Extra Wide Calf or Super Wide Calf), you have two options: you can order the smaller calf style if you need only 1-2� more in size and then have them stretched on a boot stretcher OR you can order the next category and have them taken in at the seam by a shoemaker. Either of these choices will customize the boot to your specific calf measurements. Why do the ankles look or fit loose on me? 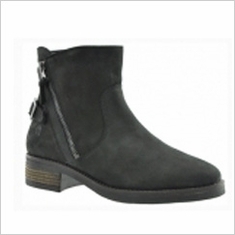 Boots should always be a bit loose around the ankles and no boots should fit tightly against them. 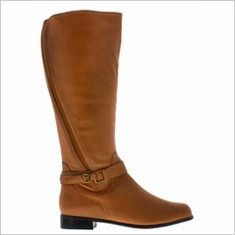 In order for the boots to fit you comfortably when you walk, you need extra space in them to move freely. If they are too fitted they will dig into your ankles and they will hurt when you walk in them. The ankles on "standard" calf boots are also loose on the women who wear those and wrinkles and gaps at the ankle of your boot are completely normal. What if my calf is larger than any of the ones shown on your site? There are no boots AT ALL made anywhere with wider calves than we carry unless they are custom made for you. We have the majority of our boots specially made for us with an elastic gore near the zippers and you can take them to a shoemaker to have them altered. A shoemaker can make the elastic gores larger or even add more leather to the seams. Since our boots already have the widest calf size on the market to begin with, you don't need to add 6-7 inches of extra leather to a 16" calf boot. This is a very simple and inexpensive procedure and our customers have been doing this for many years. The only other option for you would be to have boots custom made and that is extremely expensive (at least $800). What if my boots are a little too tight around my calf when I first try them on? If your new boots are a bit tight, you can either wear the top portion of the zipper unzipped for about an inch until the soft leather stretches out after a few wearings, or you can have them stretched on a boot stretcher by a shoemaker. What if I want to wear warm socks in my boots? If you are planning to wear a pair of warm socks for the cold weather (which you can do even with dress boots since they come all the way up to your knees and no one will see them! ), please make sure to order either one size larger than you normally wear (e.g., if you wear a size 7M, order a 7 1/2M or a 7W) or one width wider than you normally wear (e.g., if you wear a 7W, order a 7WW or 7 1/2W). When boots are made, there is no extra room for socks since they are sized for bare feet, nylons or a thin trouser sock � just as shoes are. You can always buy a pair of Dr. Scholl�s insoles to put inside the boots to make them tighter in the event that they are a bit too large or if you will want to wear a thinner hose on warmer days. Why do the stretch boots I ordered look so small for my calf? The boots you ordered are SUPPOSED to look this size � IT IS NOT A MISTAKE! They cannot be manufactured in their full size since they would continue to stretch and they would fall down on your leg after a few wearings. If you are within the calf size range listed in the descriptions, they will stretch considerably to conform to your leg and they will soon fit you comfortably and go on more easily so do not worry! If you have never owned or worn a stretch boot, they do not go on or fit the same way as a regular non-stretch material (leather or manmade) boot does since they are meant to fit close against your calf. Please follow the simple steps in the instructions that are in your boot carton since they will most likely not zip up in one continuous motion the first time you put them on. How do I convert my metric calf measurements to US sizes? Since we cannot make a chart that includes every conversion size from centimeters into inches, please go to this link and insert your calf size for the correct metric conversion to US inches: Metric Conversion. You can also use Google to find any other site that you choose for yourself. Once you know the metric equivalent in US inches, you can choose a boot that you like, look up your shoe size/width and find the corresponding calf size for your foot size. You cannot order a specific calf size for any boot since each boot is already manufactured with the calf size shown online. 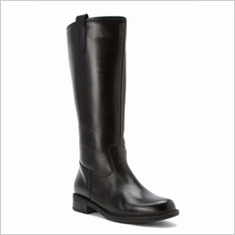 How do I care for my leather wide calf boots? Boots receive more wear and tear than shoes because of adverse weather conditions and in order to keep your boots in the best condition and to prolong their life it is important to take good care of them. You will need a leather care cream or lotion (neutral color) and those are available for purchase in most supermarkets and drug store chains. Using a soft, slightly damp rag or cloth such as a T-shirt, first clean any dirt, dust or grime off of your boots. Apply the polish in even, thin layers and buff with a soft, dry cloth until it is absorbed into the leather. You can then also apply a water and stain protector spray if you would like. Remove salt and dried on dirt as it appears and never dry boots near a radiator because it will crack the leather. The directions should also appear on your leather care product and those can be followed as well. Your satisfaction is Guaranteed! If you are unhappy with your purchase, we will gladly make an exchange for you, give you a refund or store credit for any unworn items that were not bought as a final sale. A return authorization is required for any return or exchange - any unauthorized return will be refused. Please contact us by email to return or exchange your boots and we will be happy to give you a return authorization number and shipping instructions. We are sorry, but we do not refund any shipping costs. If an exchange is needed, please email us to explain your requirements and we will be happy to suggest another style or size for you. 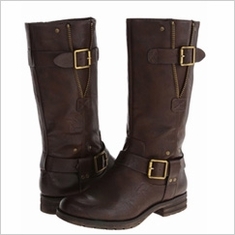 Since exchange requests are subject to inventory availability at the time that we receive your boots, we would highly suggest that if you want to ensure receipt of your new item(s), or if you are in a hurry, you should place a new order and we will credit your original order when we receive your return. Any item to be returned or exchanged must be unworn and re-wrapped in its original boot carton and condition (with all boot packing materials). There will be a $5 re-boxing fee for any boot that is returned without its original box or if the original box is ruined by taping over it. We do not have access to extra cartons since we do not manufacture these boots and they must be returned in condition to be sold as new. Boots returned within 30 days of the invoice date will be issued a full credit to your credit card account pending our inspection of the boots. Boots returned past 30 days of the invoice date will be issued a store credit (pending our inspection of the boots) that can be used for any future purchase and these late returns are subject to company discretion. Any delinquent return will be given a store credit for the current price of the item - if it is on sale you will get a store credit for that amount. Sale items must be returned (or exchanged) within 30 days of your invoice date in their original carton and condition for a full refund to your credit card account. 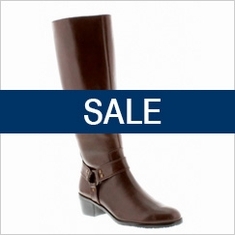 Sale boots will not be authorized for return at all past the 30 day limit. We are not responsible for the return charges and it is recommended that your item be insured in case of loss or damage. How do I use my store credit for another purchase? 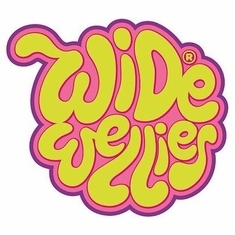 If you have a WideWidths.com store credit you can place your order as you normally would. Since you will not be able to redeem it in our shopping cart, please put your store credit number in the �comments� section of the order form and it will be deducted at the time the order is being processed. Your bank authorization will be for the entire amount but we will bill you ONLY for the difference after the credit deduction. 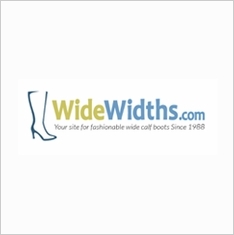 WideWidths.com accepts Visa, Master Card, Discover and Amex. We also accept Visa and Master Card debit cards. All cards are subject to address verification by your financial institution at the time of your purchase. Please note that we do not accept cash, personal checks or money orders for online purchases, nor do we ship orders C.O.D. Is it safe to order online from your site? This site is hosted by Yahoo! Store. Yahoo! hosts the store pages, ordering system, and order data and by using industry standard SSL (secure socket layer) encryption, the security of your information is ensured. Our website is verified by Truste, one of the nation's leaders in protecting personal privacy. We are required to collect sales tax from New York State residents only. There are no longer any sales tax exemptions for items under $110. Your credit card account is not charged until the order is processed for shipment - it is not charged when you place your order, it is only authorized by your bank at that time. Why does my credit card look like it has been billed twice? Your credit card company will authorize your purchase at the time you place an online order but we do not bill you until the order actually gets processed for shipping. Depending on the credit card companies, your purchase may appear on your account but it has merely been set aside by your bank as an authorization for the merchant and it has not been charged to you yet. WideWidths.com respects our customer�s privacy and we will not sell or rent your personal or email information to any third parties. We will only use your email address to inform you of new products or promotions and you will always have the option to �opt out� of any future emails from us by clicking on the link at the bottom of any email we occasionally send you. What if the item I order is not in stock? If the item you order is not available for immediate delivery it is generally on �back-order� and it is only a matter of a short period of time that our manufacturers will be shipping the items to us. If this is the case, we will notify you by email that your order is �on hold� and your credit card WILL NOT be charged until your order is ready to ship. What if I didn�t receive my entire order? If you ordered more than one item and one is not currently in stock, we will email you to let you know when the other item will be available. We will generally ship what is in stock and your credit card will be charged ONLY for the item that has been shipped. What if I need to get in touch with you about my order? After you have placed an order with us, you will automatically receive a confirmation email. Your order number will be the 5 digit number in the subject line of that email. Please save it because you will need to reference it if you have questions about your purchase.